Jostling amidst book hungry crowds at the weekly market in Daryaganj is a treat every Delhi dweller and city traveller must partake in. Stretching for nearly two kilometres on Asaf Ali Road is a pavement full of the most eclectic collection of books you’d find anywhere. From a 1942 Yugoslavian edition of Twenty Thousand Leagues to Monet’s letters, Premchand’s Complete Works or a tattered Jackie Collins paperback, this Sunday book market is certainly for everyone. Whether your vocation or interests lie in art, architecture, design, food, medicine or comics, you’ll find that strolling through the narrow pathway lining the book-display is a wonderful way to start your Sunday. Shop for wordy treats from around the world here. 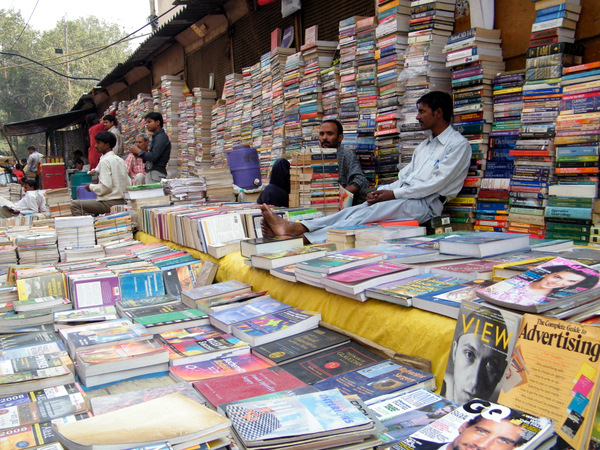 Posted in Books, People of India, Tale Trails, Tips, Travel, Wondrous India and tagged art, Books, Bookstores, Classics, Daryaganj, Daryaganj Book Bazaar, Delhi, interiors, Novels, Old Delhi, Reading, Streets, Sunday, Things to Do, Tips, Travel, Walking. Bookmark the permalink.